Stannis is in a race for the throne with his younger brother, Renly, upon Robert's passing. Stannis claims a new sigil represented by a fiery heart. 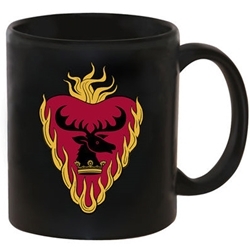 The time has come to claim The Game of Thrones Stannis Baratheon Sigil Mug.